Mercantile and agricultural activities influenced the settlement patterns of Scottish immigrants to Newfoundland and Labrador during the 19th century. An influx of Lowland Scots arrived on the island's east coast in the early 1800s to take advantage of new opportunities in trade and commerce created by the colony's growing resident fishery. These immigrants were largely merchants and businessmen who settled in St. John's and other mercantile centres on the Avalon Peninsula able to support merchant firms, shops, and other commercial establishments. Most Lowland Scots wished to benefit from Newfoundland and Labrador's growing economy, resident population, and associated trade opportunities. Drawing by William Gosse. From Prowse, D.W., A History of Newfoundland. (London: Macmillan, 1895) 445. In contrast was the migration of Highland Scots to southwestern Newfoundland beginning in the 1840s and ending in the 1860s. Unlike their Lowland counterparts, these men and women were farmers by trade and settled on agricultural land in the Codroy Valley and St. George's Bay. Most did not arrive from Scotland directly, but instead came from Cape Breton Island, where thousands of Highlanders had migrated during the late 18th and early 19th centuries. The early 19th century brought much economic prosperity to Newfoundland and Labrador. The colony acquired a virtual monopoly over the international saltfish trade during the Napoleonic Wars (1803-1815) and its rapidly growing economy attracted immigrants from overseas. Most new settlers were fishing people from England and Ireland, although smaller numbers of migrants also arrived from the Scottish Lowlands. Unlike other immigrants from the United Kingdom, very few, if any, of the Scottish migrants were fishers; most were merchants, merchants' agents, businessmen, and artisans wishing to benefit from the colony's growing economy, resident population, and associated trade opportunities. Until the 1840s, almost all Scottish immigrants came from the Lowlands and most from the port towns of Greenock and Glasgow. Merchant firms at both ports had been regularly trading with Newfoundland and Labrador since the 1770s, when the American Revolution severed their trade ties with the American colonies. Between 1781 and 1791, approximately 74 vessels left Greenock for the island of Newfoundland to trade provisions and gear for saltfish or other goods. Patrick Tasker was one of many Lowland Scots who migrated to Newfoundland and Labrador in the 19th century. 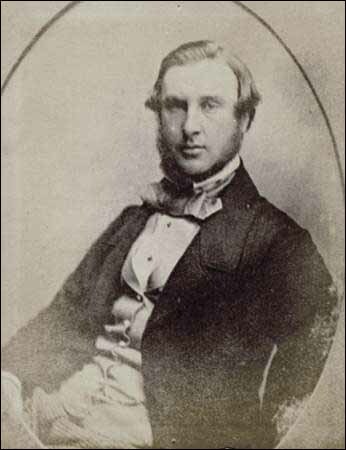 Born at Greenock, Scotland in 1823, Tasker arrived at St. John's in 1842 to work for the merchant firm Hunters and Company. Courtesy of Archives and Special Collections (MF-313), Queen Elizabeth II Library, Memorial University, St. John's, NL. As Newfoundland and Labrador's fishery evolved from a migratory to a resident industry in the early 1800s, it became profitable for Lowland merchants to establish premises on the island. 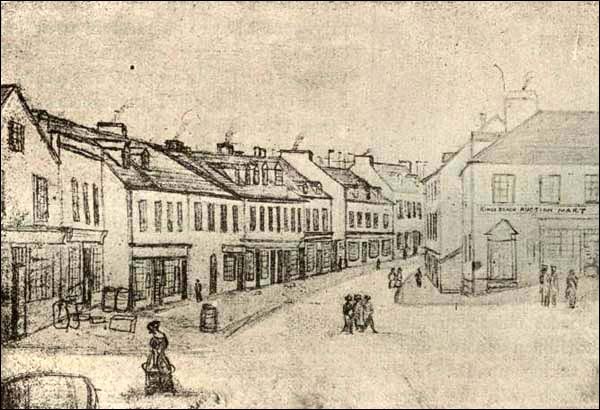 St. John's emerged as the colony's centre for trade and commerce, which prompted most Scottish merchants to settle there or in major outports on the east coast. Because Scottish migrants worked in business and trade, they had no work-related reason to live in rural or non-commercial areas of Newfoundland and Labrador. The 1857 Census reported that of the 416 Scottish-born immigrants living at Newfoundland and Labrador, 316 were based in St. John's, 50 in Conception Bay (40 of which were living at Harbour Grace), and the remaining 50 in Bonavista Bay, Trinity Bay, and other areas of the island. Most Scottish merchant firms were located at St. John's and included Baine, Johnston and Company, Walter Grieve and Company, Stuart and Rennie, Robert Hutton, Crawford and Company, and Hunter and Company. Other Scottish merchants were based in outport communities: John Munn and Company had premises in Harbour Grace, William Alexander in Bonavista, and Archibald Graham in Trinity. Although Scottish firms were outnumbered by their English competitors in Newfoundland and Labrador, they were among the most successful on the island and often possessed the most valuable properties. While Lowland Scots settled in eastern portions of Newfoundland during the early decades of the 19th century, an influx of Highland Scots arrived on the island's southwest coast between 1840 and 1860. These migrants did not travel from Scotland, but instead came from Cape Breton, where either they or their parents and grandparents had originally migrated. The movement of Scots from Cape Breton to Newfoundland was a secondary migration – some migrants had been living in Cape Breton for years or even decades before leaving, others had been born there and moved to Newfoundland in adulthood. Unlike the Lowlanders, who predominantly worked in commerce and trade, Highland migrants were for the most part agricultural workers in search of farmland – a scarce commodity in Scotland during the 18th and 19th centuries. Many families believed that by moving to the New World, they would be able to acquire good land with relative ease. Between 1770 and 1850, thousands of Highlanders arrived at Cape Breton and most settled at Inverness County on the island's western shore. Migrants came from many places in the Scottish Highlands, but the major source areas appear to have been Moidart, Morar, and the Isle of Canna on Scotland's west coast. By the 1840s, land in Cape Breton was also becoming scarce and some Scots moved across the Cabot Strait to Newfoundland's southwest coast. 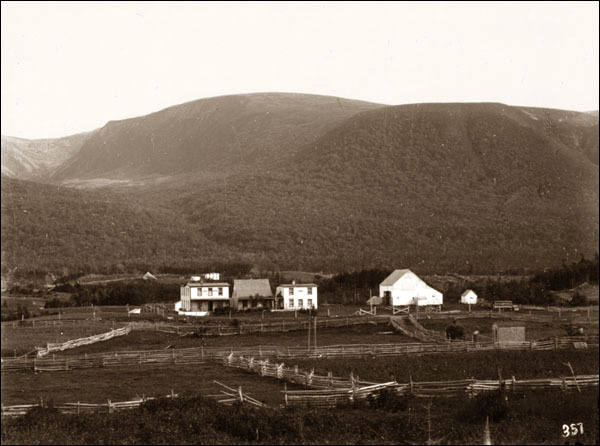 Most settled in the Codroy Valley and St. George's Bay, where land was not only available, but of a similar quality to that in Cape Breton. These migrants traveled in large extended kin groups rather than as individuals or separate nuclear families, which gave them a degree of economic and social security in times of change and uncertainty. Some Highland Scots living in Cape Breton migrated to Newfoundland's west coast during the mid-19th century. Photographer unknown. Reproduced by permission of Archives and Special Collections (Coll. 137 17.03.001), Queen Elizabeth II Library, Memorial University, St. John's, NL. Although vague census data makes it difficult to determine precisely how many Highlanders migrated to southwestern Newfoundland, historian Rosemary Ommer has determined from parish registers and oral evidence that at least 51 Scottish 'moves' occurred between Cape Breton and Newfoundland between 1840 and 1860 – a 'move' consisted of at least one nuclear family, but may also have encompassed extended kin groups (Ommer 1977). Ommer also determined that, of the roughly 171 households at Codroy Valley in the 1880s, 67 (38%) belonged to people of Scottish descent (Ommer 1973). While the vast majority of Scottish migrants to Newfoundland and Labrador settled on the island's east and southwest coasts, smaller numbers moved to other regions. Some Scots migrated to Labrador in the 19th century to work for the Hudson's Bay Company (HBC). Prominent among these was Sir Donald Smith, who became the HBC's chief trader for Labrador in 1852 and established the company's headquarters at North West River. Smith lived at Labrador for 21 years before becoming Lord Strathcona in 1897. Another Scot, Highlander John MacLean, explored the interior of Labrador while trying to expand the HBC's fur trade in the region; he became the first white man to journey overland from Ungava Bay to Hamilton Inlet in 1838, and the following year became the first white man to visit the Grand Falls (today known as Churchill Falls).